Expedia can help you save loads with a Manang vacation package. With all that extra money in the bank, you might even like to lock in a few more nights. Smart travelers who grab a package deal on Expedia will save as much as 40,450 YEN*. Click through our comprehensive database of more than 400 partner airlines and 321,000 properties worldwide. Too many to select from? Don't worry — we'll help you decide! Still undecided? There are no hidden fees from us if you make changes to almost any reservation. There are heaps of amazing things you can do when you're in a new place. So why not get your trip to Manang off to a flying start by checking out some of our recommendations? After all – out there starts here! Temples have long drawn pilgrims searching for divine enlightenment in a confusing world. Head to the hallowed site of Muktinath Temple and enjoy your own sacred experience. You'll discover lots to keep you busy in and around this destination. Creep through the caverns, shafts and tunnels at Gupteshwor Mahadev Cave. If you're feeling bold, switch off your torch and spend a couple of seconds in the pitch-black darkness. Still have time on your hands? The wider region offers some must-do activities, like mountain biking. Get outside and give it a whirl! Expedia presently doesn't feature any property listings for Manang. However, you can find a few places to stay in Ghachok, which is 25 miles (40 km) away. Your best bets in Ghachok are the Himalayan Front Hotel and Himalayan Deurali Resort. Organized the flights for your trip to Manang yet? When you arrive, prepare to walk out into Pokhara Airport (PKR). It's 35 miles (56 km) from the terminal to the middle of town. 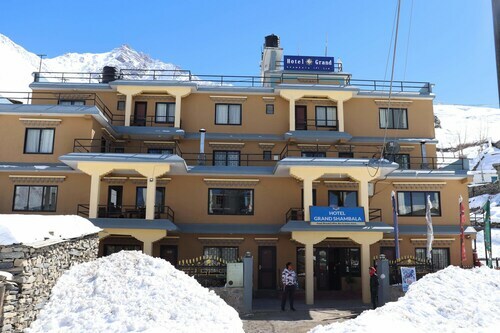 Located in Mustang, this hotel is 0.1 mi (0.1 km) from Annapurna Conservation Area and 1.2 mi (2 km) from Muktinath Temple. Padmasambhava-Chumig Gyatsa is 0.9 mi (1.5 km) away. Located in Mustang, this hotel is 0.1 mi (0.1 km) from Annapurna Conservation Area and 8.6 mi (13.9 km) from Muktinath Temple. 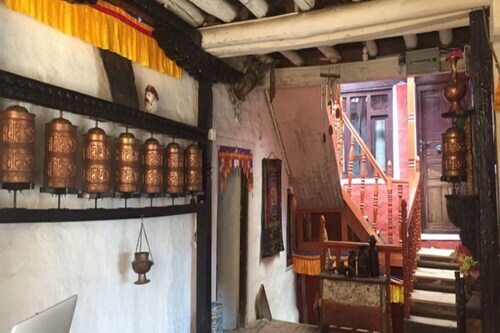 Located in Mustang, this hotel is within a 15-minute walk of Annapurna Conservation Area and Muktinath Temple. Padmasambhava-Chumig Gyatsa is 0.5 mi (0.9 km) away.